Kara Johnson is an enthusiastic, energetic and hard-working real estate agent with a Master’s degree from New York University in Paris. She has 8 years experience as a real estate agent with Keller Williams Capital Properties as well as 7 years experience in international program management and complex event planning. Fluent in French, Kara coordinated and executed high-visibility visits for senior foreign military officers and high-ranking government officials while with the U.S. Department of Defense. She provides that same level of high-quality customer service and focused attention to her real estate clients. A consummate professional, Kara has successfully leveraged her background in diplomacy and protocol with her detail-oriented organizational skills to rank in the top producing 10% of her company. She closed over $9.4 million in gross sales volume and was awarded ‘Rookie of the Year’ in her first year as a full-time real estate agent. 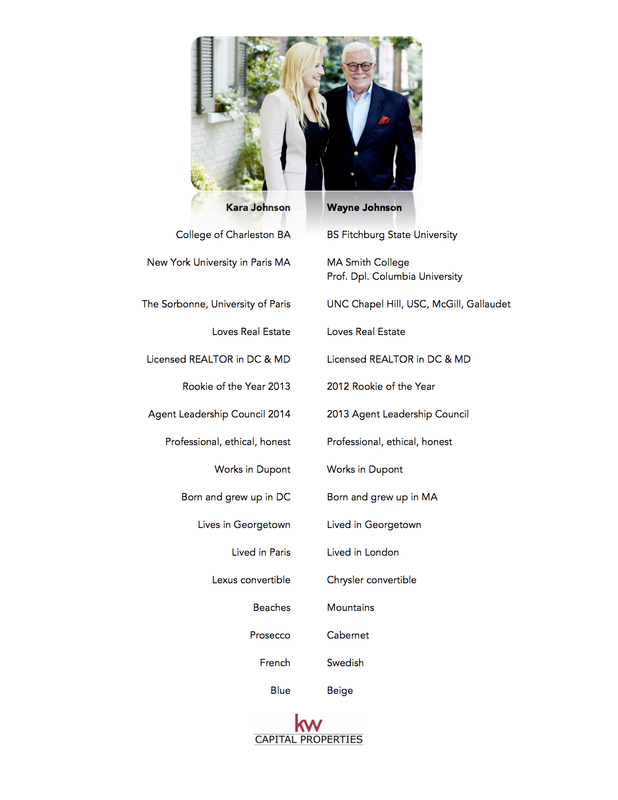 Kara sold a total of 25 properties and over $12.5 million in sales in 2014 and ranked in the top 10 individual agents for the entire Keller Williams Maryland/DC Region. She was also recognized as a Top-Producing Agent in Washingtonian Magazine’s 2015 “Best of Washington” issue. She serves on her company’s Agent Leadership Council, similar to a Board of Directors, participating in attaining the goals of the market center. A native Washingtonian, Kara grew up in upper Northwest DC in North Cleveland Park and currently lives in Georgetown. After graduating with a BA degree from College of Charleston, Kara lived in Paris for several years where she earned her Master’s degree in French. Kara has earned the respect of many international and foreign service clients in her work as a REALTOR® and has developed a large and loyal client base. Kara takes pride in the level of care and attention she dedicates to each client. Wayne Johnson is a licensed REALTOR® in the District of Columbia and Maryland. 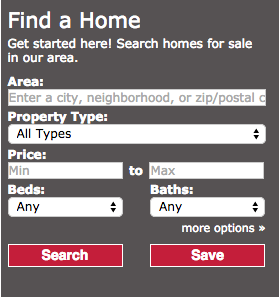 Wayne specializes in fine residential properties and has helped many buyers find that perfect property. Whether you are buying or selling, you will find that Wayne represents his clients’ interests with the utmost of professional integrity, attention to detail, and personalized service. Wayne grew up in Massachusetts where he spent summers on Cape Cod. He earned his BS degree at Fitchburg State University and an MA from Smith College in affiliation with the Clarke School for Deaf. He was a teacher for 5 years at Lexington School for the Deaf in NYC where he lived in Manhattan and earned a Professional Diploma from Columbia University. He also spent a year in London as a teacher while living in Chelsea off Kings Road. He moved to DC and founded one of the first public school programs in the country for hearing impaired infants and their families and served on the Advisory Council for Maryland’s universal newborn hearing screening program. Along the way he completed additional graduate studies at UNC Chapel Hill, USC, McGill, and Gallaudet. After retiring from Maryland, Wayne became a special education coordinator in Alexandria VA where he worked in the central administrative office and oversaw programs for children with disabilities primarily in the Old Town area of the city. Wayne has also been involved in real estate for more than 35 years as an investor, landlord, and homeowner. His first purchase was in Georgetown many years ago, and he still owns it today along with several other properties in DC, Rehoboth Beach DE, and the mountains of Western NC. Since moving to DC many years ago, Wayne has lived in Georgetown, Palisades, and Cleveland Park North. He is married to Dr. Frankie Mickelson, a native Washingtonian who grew up in 16th Street Heights and whose family owned the Mickelson Gallery in Penn Quarter. Frankie just retired from a long career as an audiologist. Together they have two daughters of whom they are very proud, Kara and Erika, a son-in-law Michael, and two joyful grandchildren, Mark and Emily. After a second retirement from Virginia, Wayne went back to his long-time passion for real estate and joined his daughter, Kara Johnson, as a REALTOR® with Keller Williams Capital Properties, and has loved every minute of it! Wayne was named ‘Rookie of the Year’ in his first year as an agent and appointed to his company’s Agent Leadership Council in his 2nd year. He also has taught classes to new agents as part of the KW Ignite curriculum. Working with Wayne and Kara, you get two real estate professionals representing your needs and will feel like you’re our only client.